Usually when I get ready to make a new blog post on a promo model I have seen it for sale at some auction site but this time I took a bit of a different run at it. I tried to find the car first. 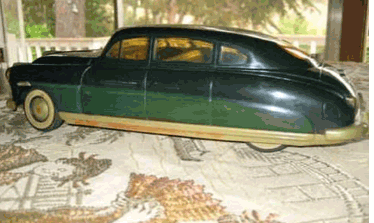 In this case a 1948 Hudson Hornet. Why that? Sure its part of the American Motors family tree but why not? I had never seen one so it was time to hit the trail. For anybody reading this blog over the age of 60, this will be one of those articles where you might say, Yup, I remember that.”, for those of us who are under that it will be a history lesson and for those who are really under that, like my 14 year old daughter, you saw some of this in Disney’s Cars movie where a Hudson Hornet (a ’51) played a prominent role. The Hudson was created with the idea to offer improved transportation at a reasonable cost, well duh! Hudson was successful almost from the start in serving the upper middle-class motorists of the day. Up to the start of World War II, it was one of the more successful independent car makers. Unlike most of the pioneer automakers, the Hudson wasn’t named for the man who created the car, but for the man who financed it, Joseph Hudson, owner of a giant department store. The real deal fully restored will go for around $40,000 but good luck finding one or an owner who wants to part with it. The same is true for a promo model which in the traditional sense is not really a promo model car but who wouldn’t want to have one of these. I looked everywhere and finally came across two 1948’s out of a private collection and were produced at the time to promote the brand’s new “stepdown design”. It was tough to find what scale they were. the only description said that they were large and 13 inches long making them larger than 1/18th scale, perhaps 1/16th scale. They were all hand made on an assembly line and just 20,000 were made in two-tone blue, two-tone green and two-tone maroon. The green one was sold for $800 while the half clear one went for $1,400 and claimed to be one of the rarest ever seen. I also read one went for just over $1,800! These weren’t really meant to give to the dealer’s customers but rather a selling tool. Somewhere I do believe I’ve seen a Nash Rambler or Rambler similar to the clear one noting it’s larger size. They were made of plastic but I have never seen ones with the usual warping. There is an interior and an underframe. After the production run the molds were reportedly sold to Louis Marx and Company, an American toy manufacturer in business from 1919 to 1978, for $35,000! So I had to check. I’m not a finance guy, my wife handles all of our stuff, but found a inflation calculator and in adjusted dollars in 2011 would be…..wait for it….$322,526.50. If I were the Hudson guys, I would have been laughing all the way to the bank. 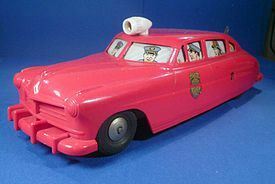 Marx took the dies and essentially made toys out of them like this 1948 Hudson fire chief car which is of value for the toy collectors. This then is pretty much where the idea of the promo model the promo model making started as other companies began making plastic vehicles for the automobile industry. What I found interesting is that there was nothing made during the Hornets most famous time when they ruled NASCAR. Nope, not Ford or Chevy, Hudson. 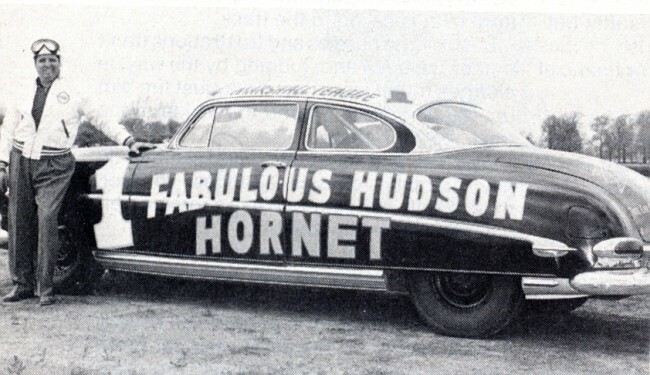 The “Fabulous Hudson Hornet” was a famous NASCAR Grand National (now Sprint Cup Series) and AAA stock car. The nickname came from it’s drivers Marshall Teague and Herb Thomas. When combined with the car’s light weight and low center of gravity, because of its monocoque body, the Hornet allowed Teague and the other Hudson drivers to dominate various stock car racing series from 1951 through 1954, consistently beating other drivers in cars powered by larger, more modern engines. Teague and his crew chief Smokey Yunick won 27 of 34 events in major stock car events, including seven NASCAR events. But all things come to an end and Teague left NASCAR during the 1952 season in a dispute with NASCAR’s owner Bill France, Sr. So not only was the Hornet there at the start of promotional model car manufacturing, the Hornet was also there when NASCAR got its start. Hudson went on to merge with Nash in 1954 to become American Motors and the name was retired in 1957 with the last car rolling off the production line in Kenosha, WI and with Marx Toys went out of business in 1978 so that’s pretty much the end of the story. Somewhere, those production molds for the promo model might exist. Can you imagine what a find that would be? I have two of these Hudson one just like the one in the picture red frame on bottom and everything…..sure wished I knew how and where to sell them. I WAS REALLY EXCITED TO RUN ACROSS YOUR BLOG AND READ IT THROUGH. I JUST AQUIRED THE HUDSON PROMO THAT IS CLEAR ON ONE SIDE. IT IS IN GREAT CONDITION FOR ITS AGE AND THE FIRST I HAVE SEEN UP UNTIL NOW. I WILL DEFINATELY BE SELLING MINE IN THE NEAR FUTURE AFTER GETTING BACK HOME AND GETTING PLENTY OF PICTURES OF IT. MINE IS THE BURGUNDY COLOR WITH ONE SIDE CLEAR.